ST. AUGUSTINE, Fla. (Jan. 3, 2012) – A member of the Florida Army National Guard’s 53rd Infantry Brigade Combat Team died Monday when he drowned in a lake at a west Florida golf course, according to the Hernando Count Sheriff’s Office. Staff Sgt. David Voiles, 43, of Brooksville, is assigned to A Company, 53rd Brigade Support Battalion, as a traditional National Guard Soldier. He was not on duty at the time of death. 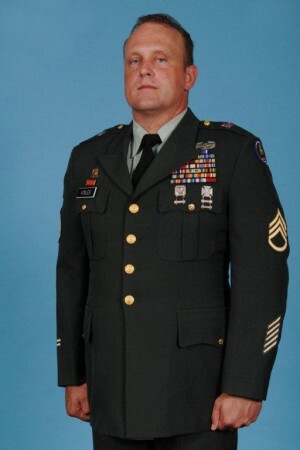 A Company, 53rd Brigade Support Battalion, is based in Pinellas Park, Fla.
Voiles served as a motor transport operator, and had more than 20 years of military service. He deployed for Operation Iraqi Freedom with the Tennessee National Guard 2004-2005, serving in Kuwait and Iraq. He was awarded the Purple Heart and the Army Commendation Medal. He joined the Florida Army National Guard in January 2006. According to Hernando County Sheriff’s Office spokesperson Cpl. Wendy McGinnis, Voiles was a certified diver and was searching for golf balls Monday afternoon in the lake at the Sherman Hills Golf Course in Brooksville. He was reported missing Monday evening and divers from the Pasco County Sheriff’s Office assisted with the search. Law enforcement officials recovered the body of Voiles Tuesday morning shortly before 11 a.m., and have ruled the death an accident.